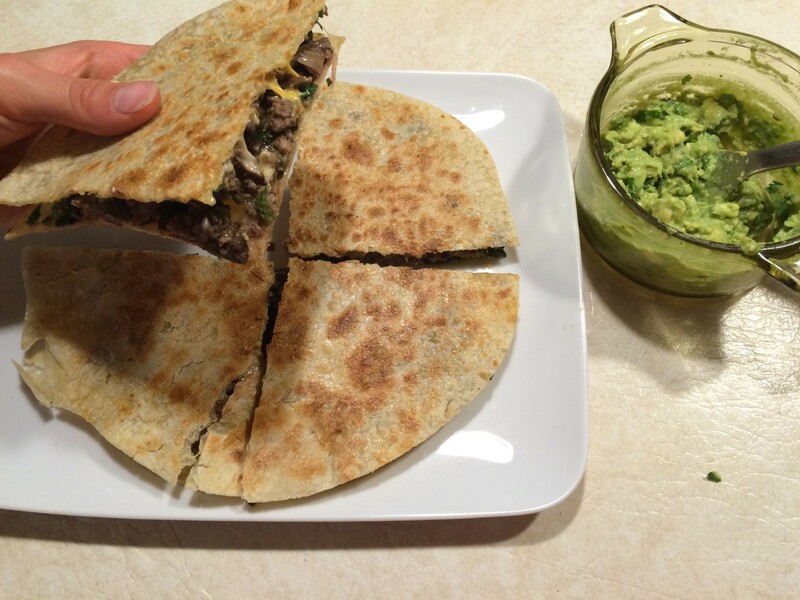 Clean Lunch – Brown rice quesadilla with ground bison, chard, mushrooms and Daiya “cheese” w/ guac. If it seems like have be neglecting my blog lately, well your right, I have! I’ve decided to embark on a 21 day cleanse called the Clean Cleanse. (cleanprogram.com) and this has taken all of my extra time and energy. Time because I am preparing 99% of everything I put in my (and my husbands) bodies. And energy b/c this cleanse has really drained me this time around. I think I had/have a lot of toxins to flush and I also have had trouble making time to sleep longer. I did this cleanse a few years ago and really liked the results and felt like it was a program I could stick with. I tried a juice cleanse once and thought I was going to starve to death or choke someone! I made it 1.5 days though a 3 day juice cleanse. I hate not finishing something, so this really bothered me. However, on the Clean Cleanse, your eliminating all of the potential allergenic foods (diary, gluten, soy, corn, eggs…along with sugar, caffeine, and alcohol). You have a smoothie or soup breakfast and dinner (with a 12 hour fasting window in between) but you can eat a solid lunch meal and solid “clean” snacks. This allows the body to detox and reduces inflammation in the body. In essence, you are letting the digestive system rest/recover. I stuck with it for 21 straight days the last time and never felt better! I slept great, my energy was awesome (after an adjustment period), and I felt lighter and lost those few extra pesky pounds my body wanted to hang on to. My husband did it with me and I think the effects were ever stronger on him. He even had an acute case of eczema disappear after trying prescription strength creams for weeks. So, I’m 2 weeks in right now and this time around has been very different for me. One, is my low energy, but that is mostly due to lack of sleep. See, now I have a toddler and he gets me up around 5am. I find it difficult to get to bed earlier than 10pm, but that’s really what I need to be doing. Also, I got swollen lymph nodes in my armpit and behind my left ear. It’s not uncommon for me to have swelling in the one behind my ear when I’m fighting something off. But the armpit one is really annoying. I’m going tonight to try a lymphatic massage to try to drain them. I hope it works. I’ve read that this is common during a cleanse as toxins try to find their way out of the body. On a good note, I’ve dropped 5 pounds and feel lighter and my body feels more supple. I feel good when running (for the first time in a long time) and more flexible when doing yoga. That part of it has been great. Anyway. Just checking in with anyone who reads this and I’ll be back soon. Hopefully I can make it another week and then get back to posting some good recipe ideas when I have more time. As a side note. I dont work for The Clean Program and I’m in no way affiliated with them. The views above are only from my personal experience.